Many websites rely on collaborative filtering for cross-sell product recommendations: she who bought this also bought that. However, this filtering doesn't work effectively for new products as that kind of data doesn't exist when a product is brand new. And since the newest products are often the ones you want to push the hardest in cross-sells, this poses a challenge. This has been called the cold start problem, and it can be overcome. So how do you create good product recommendations before sales? There are a couple ways I can think of that work. First, there's the old-fashioned way of adding cross-sells by hand. This might work if you're only introducing a small number of new products every month. As the collaborative filtering recommendations come online you can move those products back to relying on the automated cross-sell recommendations from those systems. 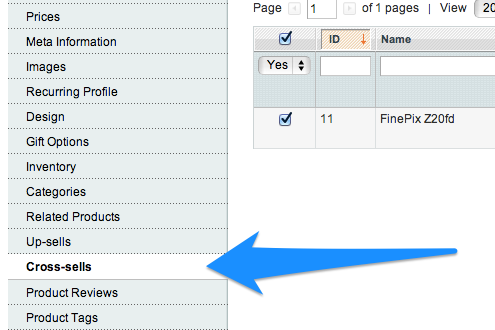 Most e-commerce platforms these days make it easy for non-technical folk to get right in and do this, such as with Magento as shown below. Unfortunately, this doesn't scale for loads of businesses. For example, one of our customers introduces many thousands of new products every month, and they're not even in the top 100 internet retailers. In that case you must find a way to automatically assign cross-sells for new products. Again, you can choose to phase out these cross-sells later as more data becomes available, but for a time they're going to drive your profits. 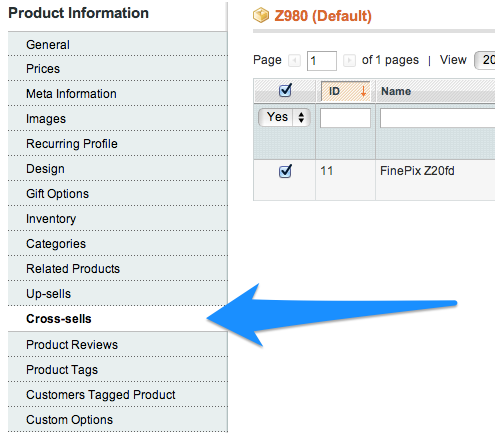 Here are two methods for adding cross-sells in bulk, automatically for new products. The first is that you pick a similar product to your new product if one is available. For example, the v1 model of the new v2. Your IT guy should be able to easily copy all cross-sells, both from the new product to accessories and from accessories to the product. Clearly this only works if the new product has a near-twin in the catalog already. But what if it doesn't? The new iPad is likely to be incompatible with many accessories that worked on its predecessor. The second solution is to use a rules-based approach based on product attributes. The new Nikon DSLR has an SD card slot, so you can cross-sell the SD cards. Or there's a new lens that is compatible with any camera with an EF lens mount, so you'd want it to show up on every one of those camera's pages. The rules approach is automatic, works at scale, and ensures that all generated cross-sells represent actual compatibility. In that way it may be more interesting than "she who bought this also bought that" because it represents genuine compatibility rather than happenstance, this-probably-works-with-that-but-no-guarantees. Full disclosure, Salsify has a rules-based cross-sell manager if this approach sounds useful to you. Cross-sells are often where companies make much of their profit, so I'm sure there are many other ways to go about dealing with the cold start problem. Have any of you tried anything else that works well?